1. Figure shows an RC phase shift oscillator. Solve the network to find the minimum value of hfe for the transistor for oscillations to be possible. Also determine the frequency of such oscillations. Take C = 0.01 µF and hie = 2 KΩ. 2. A pick up signal is power amplified using a complementary symmetry push pull amplifier and fed to a 5 Ω loud speaker as shown. ICmax = Maximum collector current = 2 Amps and PCmax = Maximum power dissipation = 1 Watt. Find the maximum power delivered to the loud speaker, if the maximum output voltage subject to OP-AMP voltage limitations is 15 volts. If the transistors are mounted on a heat sink, so that PCmax changes to 3 Watts. What will be the new value of the maximum power delivered? 3. In the figure, the operational amplifier is ideal and its output can swing between – 15 and + 15 volts. The input Vi, which is zero for t<0, is switched to 5 volts at the instant t = 0. Given that the output Vo is + 15 volts for t<0, sketch the waveforms of Vo and Vi. You must give the values of important parameters of the sketch. 4. In figure, the operational amplifier are ideal and their output can swing between – 15 and + 15 volts. Sketch the waveform of voltages of V1 and V2 as a function of time. You must give the values of important parameters of this sketch. 5. The Two Port Darlington impedance booster of figure uses identical transistors (hie = 1 KΩ, hfe = 100, hre = hoe = 0). Calculate the Z – parameters of the network. Use relevant approximations. 6. The transistors in the differential amplifier shown in figure are identical with hfe = 100 and re = 25 Ω at 1 mA collector current. The circuit has a CMRR of 100.
a. What is the differential gain of the circuit? b. What is the common mode gain of the circuit? c. If DC voltage of 1010 mV and 990 mV are applied to inputs 1 and 2 respectively with reference to ground, what will be the output voltage Vo? 7. Consider the circuit shown in figure. This circuit uses an ideal operational amplifier. Assuming that the impedance's at nodes A and B do not load the preceding bridge circuit, calculate the output voltage Vo. When (a) RA = RB = RC = RD = 100 Ω and (b) RA = RB = RC = 100 Ω and RD = 120 Ω. 8. A JFET with the following parameters is used in a single stage common source amplifier with a load resistance of 100 kΩ. Calculate the high frequency cutoff (upper 3dB frequency) of the amplifier. Given gm = 2 mA/V, Cgd = 2 pF, Cds = 2 pF, rd = 100 kΩ and Cgs = 1 pF. 9. Find the output voltage Vo in the following circuit, assuming that the operational amplifier is ideal. 10. Assuming that the amplifier shown in the figure below is a voltage controlled voltage source. 11. Calculate the frequency at which zero transmission is obtained from the Wien-bridge shown below. 12. Find the output voltage of the following circuit shown below, assuming ideal operational amplifier behavior. 13. In the MOSFET amplifier shown in the figure below, the transistor has µ = 50, rd = 10 kΩ, Cgs = 5 pF, Cgd = 1 pF and Cds = 2 pF. Draw a small signal equivalent circuit for the amplifier for mid band calculate its mid band voltage gain. 14. Sketch the output as a function of the input voltage (for negative values) for circuit shown below. Assume ideal operational amplifier and diode forward voltage drop as zero. 15. The waveform input to the sweep generator circuit shown in figure, is a square wave of period 2 msec and amplitude varying between 0 and 12 volts. b. Specify Vo(t) determine the voltage levels and the time constants involved. 16. In the JFET circuit shown, assume that R1//R2 = 1 MΩ and the total stray capacitance at the output to be 20 pF. Determine the upper cutoff frequency of the amplifier. 17. Show that the circuit shown in figure is double integrator. In other words, prove that the transfer gain is given by Vo(s)/Vs(s) = 1/(CRs)2, assume ideal operational amplifier. 18. In the amplifier circuit shown, determine the value of R such that Q2 is biased at VCE2 = 7.5 volts. Assume Q1 and Q2 to be identical with VBE = 0.7 volts and neglect base currents. Also determine the small signal input impedance of Q1 and Q2, if both of them have β = 200. Use VT = 26 mV. 19. A common emitter amplifier with an external capacitors CC connected across the base and the collector of the transistor is shown. Given gm = 5 mA/V, rπ = 20 kΩ, Cπ = 1.5 pF and Cµ = 0.5 pF. a. Determine the ac small signal mid band voltage gain, Vo/Vs. b. Determine the upper cutoff frequency fH of the amplifier. 20. A resistively loaded and resistively biased differential amplifier circuit is shown. Neglect base current and assume matched transistors with VA -> ∞ and β = 100. Use VT = 26 mV, VBE(on) = 0.7 volts and VCE(sat) = 0.1 volts. a. Determine the values of RC and R2 to meet the following specifications: double ended differential mode gain = 500, CMRR = 500 and differential mode input resistance of 2 MΩ. b. Determine the minimum values of VCC and VEE such that the transistors remain in the forward active region under zero signal condition. Assume that the DC common mode input is zero. 21. Assuming ideal operational amplifiers, show that the circuit shown simulates in inductor i.e. show that Vi(S)/Ii(S) is inductive and write the expression for the effective inductance. 6. The transistor in the circuit shown is so biased (dc biasing network is not shown) that the dc collector current, IC = 1 mA and VCC = 5 volts. The network components have following values: RC = 2 kΩ, RS = 1.4 kΩ and RE = 100 Ω. The transistor has β = 100 and a base spreading resistance, rbb’ = 100Ω. Assume VT = 25 mV. 7. Consider the circuit given in the figure is using an ideal operational amplifier. The characteristics of the diode are given by the relation I = IS(eqV/KT – 1), where V is the forward voltage across the diode. b. If R = 100 kΩ, IS = 1 µA and VT = 25 mV, find the input voltage Vi for which Vo = 0. 8. In circuit shown, assume that the operational amplifier is ideal and that Vo = 0 volts initially. The switch is connected first to ‘A’ charging C1 to the voltage V. it is then connected to the point ‘B’. This process is repeated 'f' times per second. a. Calculate the charge transferred per second from node A to node B.
b. Derive the average rate of change of the output voltage Vo. 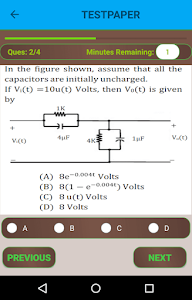 c. If the capacitor and the switch are removed and a resistor is connected between points A and B, find the value of the resistor to get the same average rate of change of the output voltage? d. If the repetition rate of the switching action is 104 times per second, C1 = 100pF, C2 = 10pF and V= 10 mV. What is the average change of the output voltage? 9. An IC 555 chip has been used to construct a pulse generator. Typical pin connections with components are shown below. It is desired to generate a square pulse of 10 kHz. Evaluate values of RA and RB if the capacitor C has the value of 0.01 µF for the configuration chosen. If necessary you can suggest modification in the external configuration. a. Draw the transfer characteristics if both diodes D1 and D2 are ideal. b. How would the characteristics change, if D2 is ideal but D1 is non-ideal? Assume D1 has forward resistance of 10 Ω and a reverse resistance of infinity. 23. Determine the input impedance of the circuit shown and investigate if it can be inductive. 24. Find the value of R’ in the circuit shown for generating sinusoidal oscillations. Find the frequency of oscillations. 25. In the circuit shown, determine the resistance Ro seen by the output terminals. Ignore the effect of R1 and R2. 26. Implement a monostable multivibrator using the timer circuit shown in figure. Also determine an expression for ON time ‘T’ of the output pulse. 27. A bipolar junction transistor amplifier is shown below. Assume that the current source Ibias is ideal, and the transistor has very large β, rb = 0 and r0 -> ∞. Determine the ac small signal mid band voltage gain (Vo / Vs), input resistance (Ri) and output resistance (Ro) of the circuit. Assume VT = 26 mV. 28. A JFET having µ = 50 and rd = 10 kΩ is used in a common source configuration as shown. The JFET capaciances are Cgs = 5 pF, Cgd = 2 pF and Cds = 2 pF. Determine the ac small signal mid band voltage gain (Vo/Vs) and the upper 3 dB frequency of the circuit. 29. Neatly sketch and label the DC transfer characteristic (Vo verses Vin) of the circuit shown, as Vin varies from – 2 volts to + 2 volts. Assume ideal operational amplifier and the diodes have a forward voltage of 0.6 volts and zero incremental resistance. 30. A transistor LC oscillator circuit is shown below. Assume that the transistor has very high value of β(so that you may neglect rb). Derive an equation governing the circuit operation, and find the frequency of oscillation. Also state the gain condition required for oscillation to start. Solution: This circuit is Colpitts Oscillator using BJT as amplifier. Refer any text book of EDC to know the condition for oscillations. We dont expect this type of questions will come these days....... as it is a 5 mark question in GATE 1999. 31. a. For the circuit shown, plot Vo under steady state conditions, with and without capacitor C. Assume that the diode is ideal. 32. For the amplifier circuit shown, IC = 1.3 mA, RC = 2 kΩ, RE = 500 Ω, VT = 26 mV, β = 100, VCC = 15 volts, VS = 0.01 sin(ωt) volts and Cb = Ce = 10 µF. 33. For a feedback amplifier, the open loop transfer function has three poles at 100 k rad/sec, 1 M rad/sec and 10 M rad/sec. The low frequency open loop gain is 1000 and the feedback factor (β) is 1. Use Bode plots to determine the phase margin of the amplifier. Is the amplifier stable? 34. Below figure shown is a common base amplifier. 35. An emitter follower amplifier is shown below, where Zi is the impedance looking into the base of the transistor and Zo is the impedance looking into the emitter of the transistor. 36. In the circuit shown, assume that the OP-AMP is ideal. 37. A triangular voltage waveform Vi(t) is applied at the input to the circuit shown. Assume the diodes to be ideal. 38. Below figure shown is a 2 – stage amplifier. 39. Consider the circuit shown. Assume the operational amplifier is ideal.